Chandra is an artist from the Twin Cities area of Minnesota. She graduated with a degree from the University of Minnesota’s Fine Arts department. Primarily working in watercolor, marker, and Chinese ink brush, she enjoys experimenting in whatever art medium happens to cross her path. Influenced by imaginative realism, Chinese paintings, the Masters and the master illustrators, her subjects tend toward the fantastical, along with dinosaurs and birds. It’s rumored that she may be a bit more than a little geeky. When not doing art she works as a social media moderator for TSR Games (not *that* one) and editor for the RPG blog Multiverse.world. She continues to live in Minnesota with her husband, daughter, a genius hound dog, a Ragdoll cat who thinks she is also a dog and a ginger tabby who rules them all. With Rob Paulsen at New York Comic Con 2013. Jennifer is a graphic designer, colorist, photographer and crafter. She has a degree in Fine Arts: Computer Graphics from the University of Tampa. She is an expert in Photoshop and Illustrator, and also experiments with yarn. 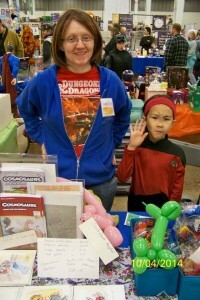 She runs a successful etsy business selling a variety of crocheted clothing and toys. As a military wife she spends a lot of time packing and unpacking boxes. She will soon be living in Las Vegas, Nevada for who knows how long. Coming along for the ride are three kids, a disgruntled cat, and a spoiled puppy.